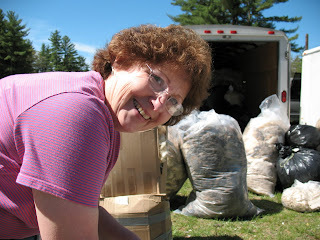 Full Service Yarn Shop: Hi Sheryl! Sheryl was busting my chops about not posting more. So, see? It worked! Hmm, where to start. I've got a lot to catch up on. Well, let's start with NHS&W. We had a great bunch go. Jarrett has a minivan now and we managed to fill it! 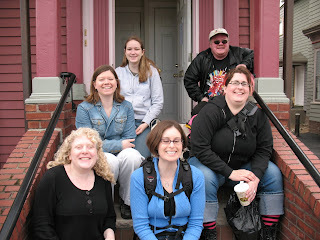 Here is our merry band about to depart. on our way to see the nice lady at the Zeilinger booth. 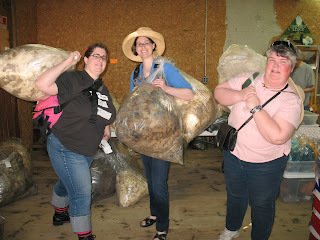 We dropped off wool there, paid them a bunch or money and sometime in August, we'll get back beautiful roving. Once that was done, we headed off the enjoy the rest of the festival. 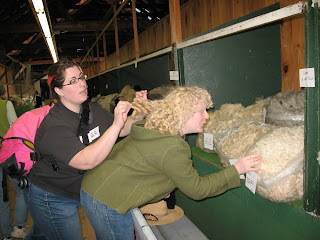 As we looked through the fleece show, we noticed something interesting. 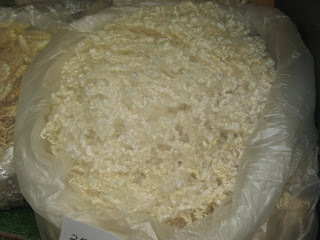 Susan's hair is the exact color and texture of some of the really nice fleece! Sarah says, "I wonder what this would spin like?" At the end of the day, I had bought more sock yarn. 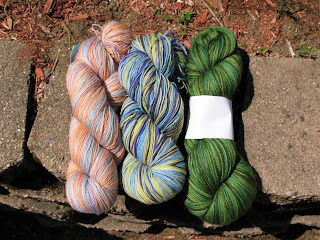 Yes, I sell sock yarn in my shop, and, yes, I dye my own. It's a disease. I can't help myself. I plan to buy sock yarn in Korea if it is humanly possible! 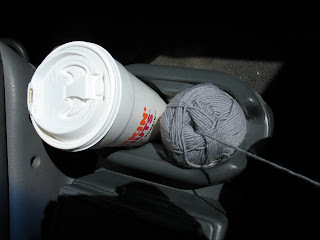 On the way home, I took advantage of the long ride to get some work done on the last gray sock. Cup holder came in handy! In my next post, which I'd better do soon or Sheryl will come in here and give me the big talkin' to, I'll catch everyone up on the gray socks and my ever changing Korea plans. I am sure they have sock yarn in korea, 'cause... well, ya gotta have socks, right? So What's Up With My Trip!? ?